About 6 months ago, I watched my first episode of Lost. 2 months later, I finished the final episode. That’s right, 6 seasons in 2 months. Don’t tell me I didn’t have a life. Since I completely missed the whole Lost bandwagon while the show was on (and therefore missed having about a thousand heart attacks due to cliff hanger episodes and white flashes that don’t get resolved until the next season) I decided that this Halloween I would celebrate Lost and its most amazing character: the smoke monster. No, no one really got what I was. 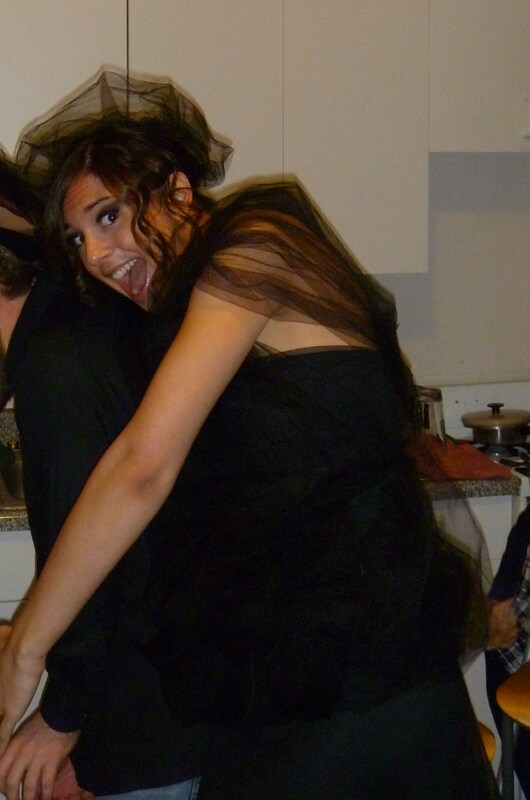 But it does look like Project Runway threw up on me. 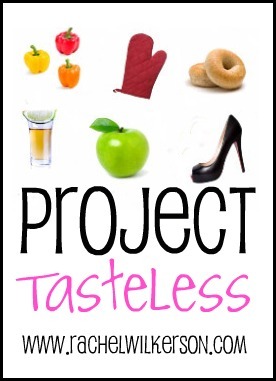 And since I love cooking with a theme, I just had to enter Rachel’s Project Tasteless for this week. 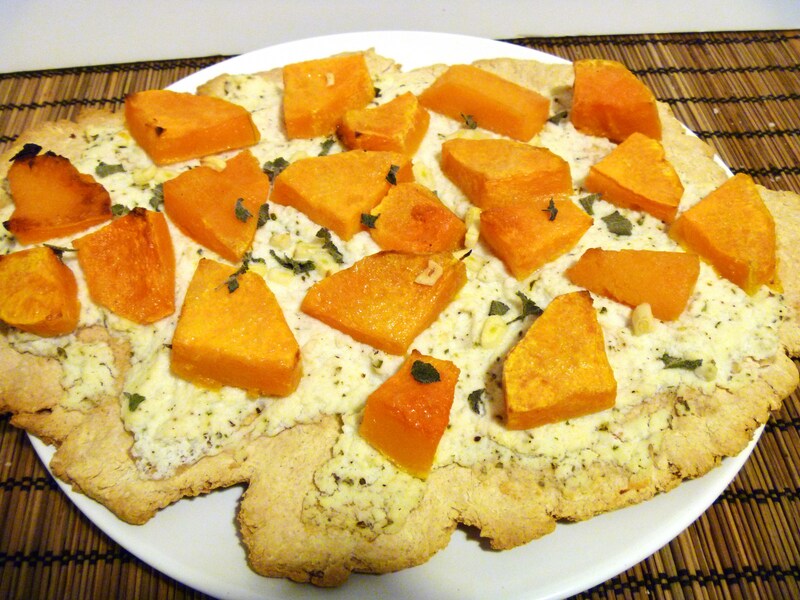 The challenge was to create a pizza based on your Halloween costume. Hmmm…. Maybe I would go all John Locke on the ingredients? Maybe I would make a pizza of Claire’s favorite food? Nah, I had to go with my costume in all its glory: Smoke Monster Pizza! Chargrilled to perfection. Just be careful it doesn’t come out of the woods and eat you alive. Beware of strange electrical sounds. But in reality, we still had to eat, and not that Smoke Monster pizza doesn’t taste delicious because well, it doesn’t. Peel the butternut squash and cut into 1 inch pieces, removing the seeds. Peel the onion and slice in 1 inch rings. Toss the squash and onion with olive oil, salt, and pepper. Put on a roasting tray and roast for 25 minutes, or until squash is soft. (Stir halfway through cooking). In a small bowl, combine the ricotta, garlic, and some more salt and pepper. Season with any extra herbs (thyme is great!). Roll out your pizza dough. 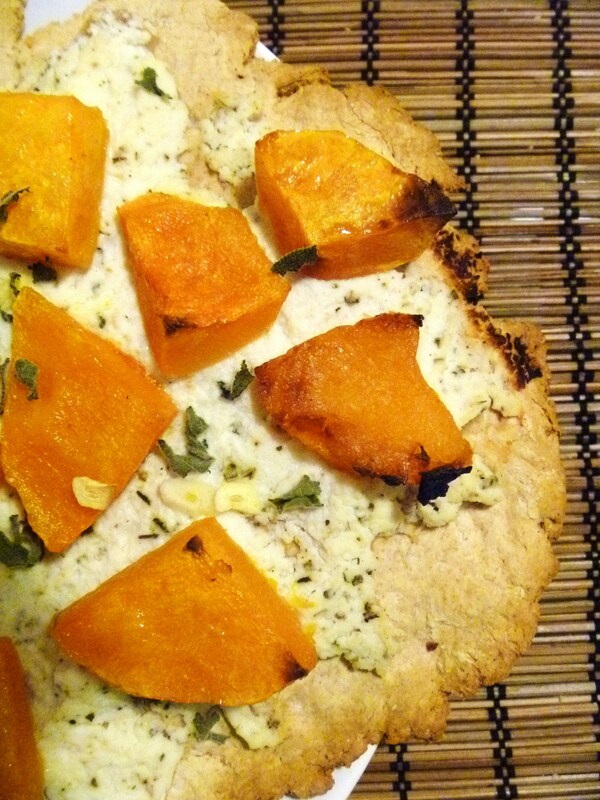 Top with a layer of the ricotta cheese, then the roasted squash and onion. Chop up sage leaves and sprinkle over top. Bake according to dough instructions. Savor, and be happy you’re not stuck on an island. Would you believe that I’ve never made an apple pie? 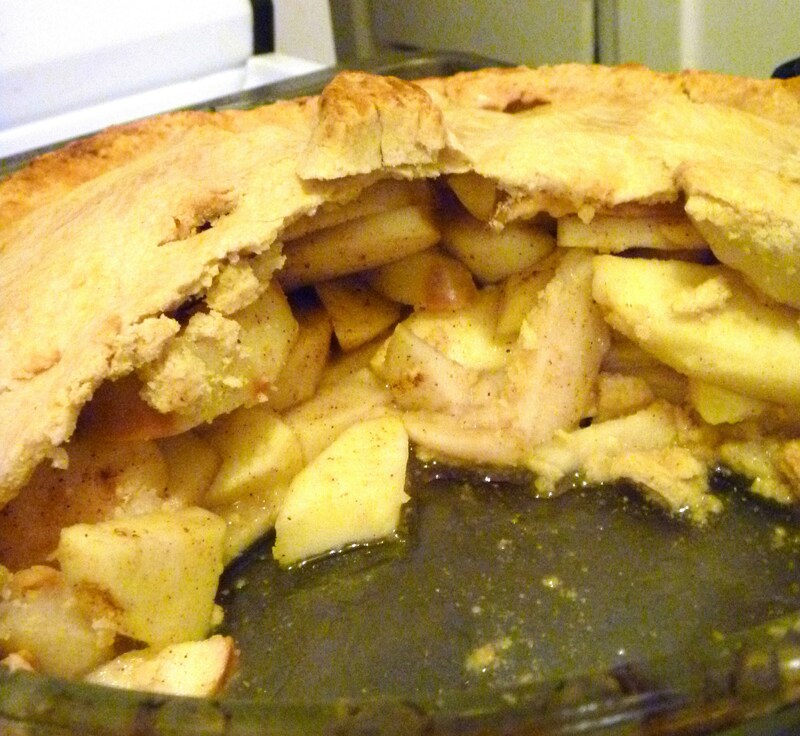 Apple pie is definitely one of my top favorite desserts, and without a doubt my favorite kind of pie. 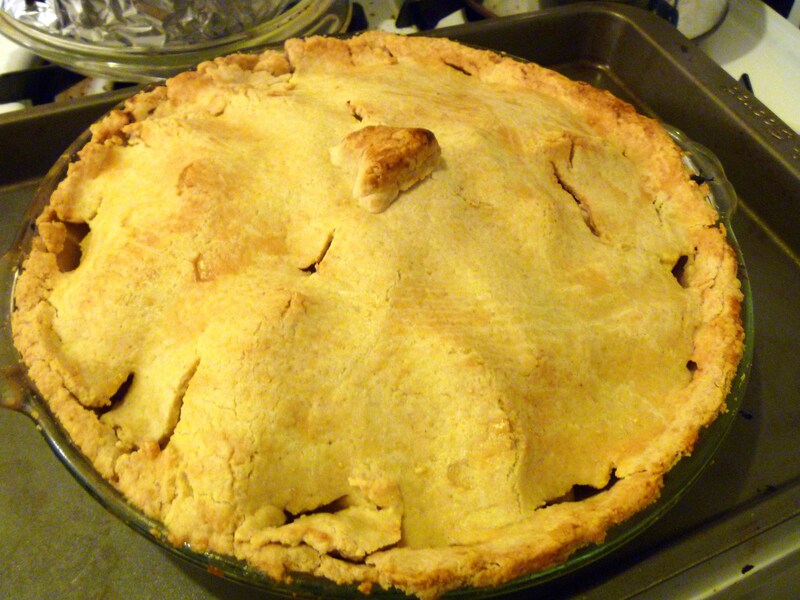 When I was younger, my neighbor would make apple pies built so high it was like a cloud being pulled out of the oven. I love it a la mode, but have a special fondness pairing a slice with a sharp, cave aged cheddar. Don’t even ask, just try it. Your vanilla ice cream with forever remain in your freezer. However, me making an apple pie is a totally different story. I don’t know why pies make me fearful, but I seem to recall many a bubbly mess from a failed crumble or overcooked tart. A pie would push me beyond my limits, without a doubt. Since I was entering a challenge, and Z had requested numerous apple pies this year with a solemn “uh huh” from me in response, I knew I had to make one for this challenge. And since this was the Naked Chef challenge, who better to turn to than the original foodie nudie, Jamie Oliver. 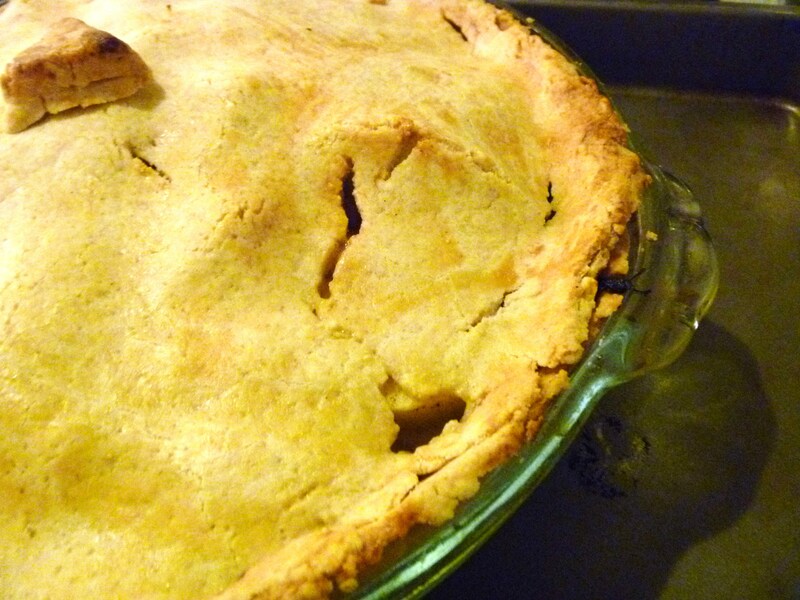 This apple pie is the quintessential British pie. Rather than a thick, cinnamon apple jelly encompassing each slice in the American tradition, these apples are individually cooked, lightly spiced, with a hint of lemon that brings brightness to the dish. 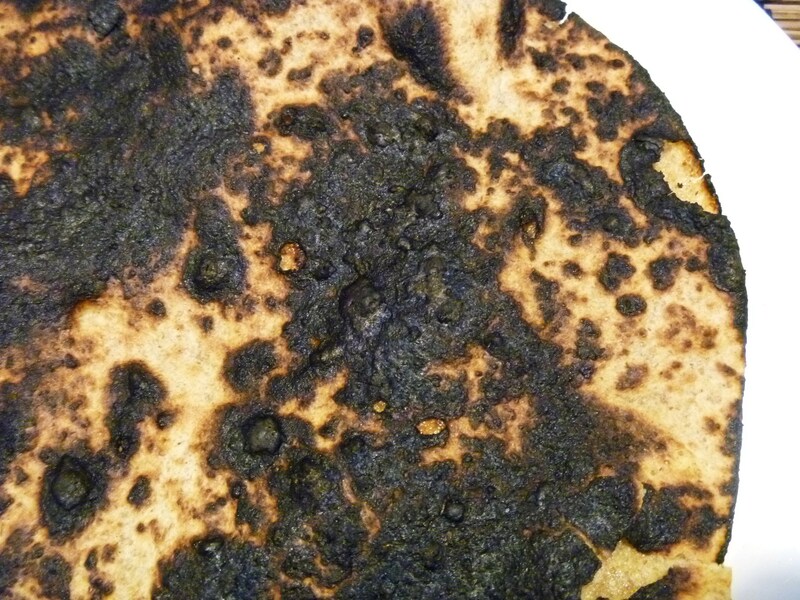 And this crust…it made me feel like I wasn’t eating something gluten free. Mix flour, xanthan gum, and cornstarch in a large bowl. Add sugar, butter, egg and vanilla and mix until combined. It will be quite crumbly. Turn the mixture onto a clean surface and knead dough until it comes together. Cut in half and wrap each half in plastic wrap. Refrigerate for 20 minutes. Peel and core the apples, then thinly slice them into about 10 slices an apple. Put in a large bowl. Add the other ingredients and toss together until thoroughly coated. Remove dough from fridge. On a floured surface, roll out one piece of dough until it would cover the pie dish with about a half-inch hanging over the sides. 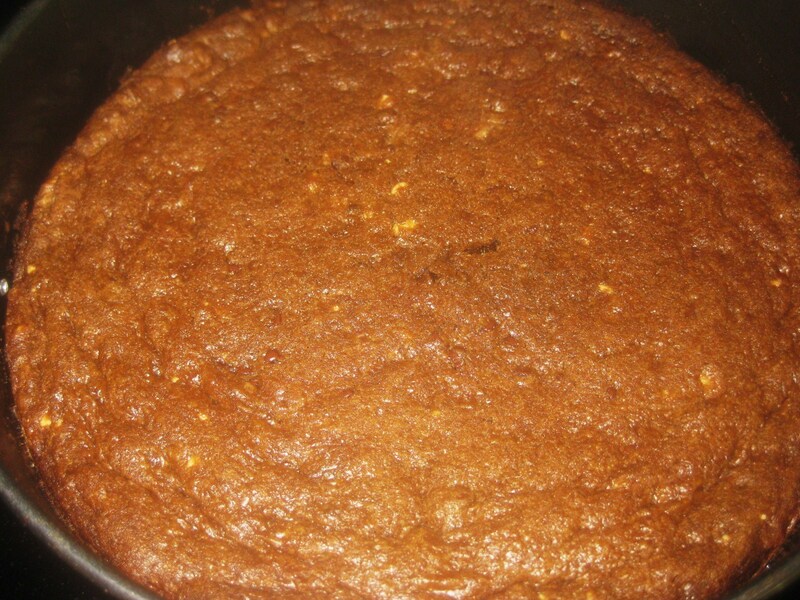 Carefully place in the pan, making sure you push the dough into the sides. Pile in the apples and pour over any collected juices. Roll out the second piece of dough and cover the apples with it. 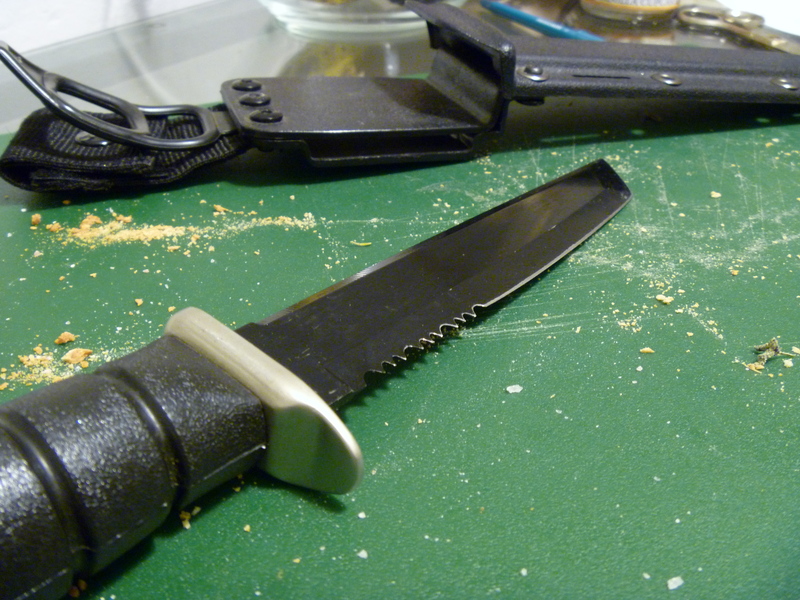 Crimp together the edges with your fingers. 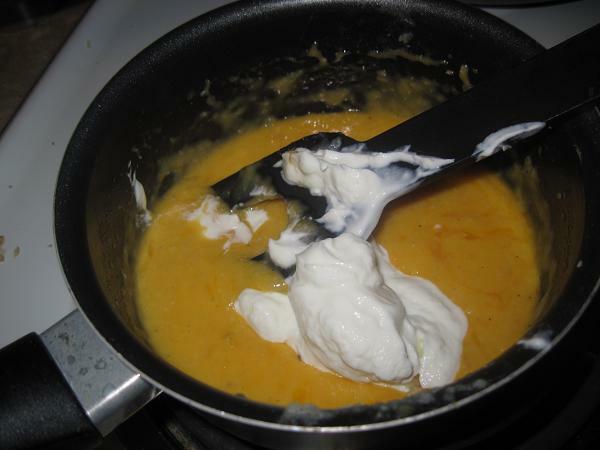 Crack and mix an egg in a small bowl. Brush egg in a light layer over pastry crust. Bake in the oven for 35 – 40 minutes, or until crust is golden brown. 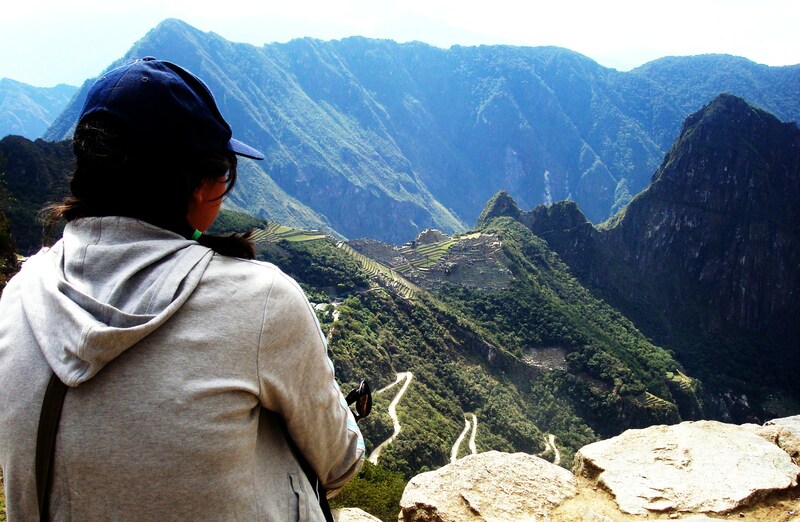 Peru was amazing. I traveled around almost the entire southern part of the country, from Lima to Cusco, driving through the Sacred Valley to Ollentaytambo, hiking Machu Picchu and crashing in Aguas Calientes, then back to Cusco and down to Puno and Lake Titicala, only to travel back to Lima for one more day before heading home. It was a trip filled with a new culture, kind people, energetic tour guides, lots of stairs, and llamas. I am now completely in love with llamas and hope to one day have one in my back yard. They are the gentlest and sweetest of creatures. I didn’t expect it to take me such a long time to get re-adjusted to normal life, but as I got used to putting my hair in pigtails every day and climbing through ancient ruins, I also basked in eating out for every meal and neglecting to check my e-mail. I spent my first week back grasping to my school email account for dear life and eating turkey sandwiches for dinner. Only once my body re-adjusted to sea level and was caught up with my Economics reading did I have any desire to set foot in the kitchen. The first meal I wanted to make after my return home was one full of comfort and warmth. Spending 9 days so close to the equator made me miss Boston’s transition to fall, and as I stepped off the plane I knew my red scarf would begin to make its daily appearance. Something hearty, healthy, and American. 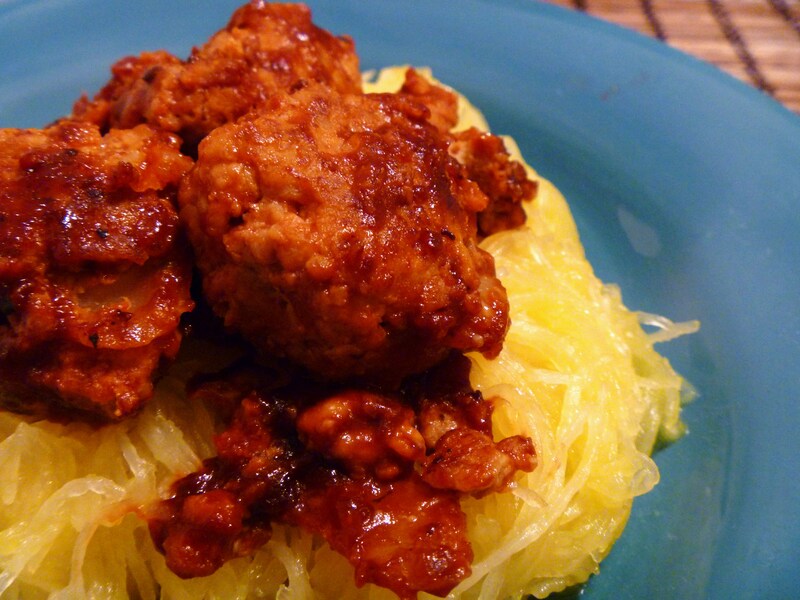 I remembered the barbecue meatballs I had seen on We Are Not Martha and knew they would pair perfectly with one of my fall favorites: spaghetti squash. A mixed-up version of spaghetti and meatballs, this meal was light and delicate with the strands of squash and perfectly moist meatballs, but received a richness from the barbecue sauce that was earthy and autumnal, no matter how frequently you may eat it during a July backyard bash. Cut the spaghetti squash in half and remove the seeds and pulp. Place each half cut side down on a plate and cover with saran wrap. Microwave for 15 minutes. While the squash is in the microwave, mix all of the other ingredients together except for 1 cup of barbecue sauce. Form 1 inch meatballs (the mixture will be quite moist). Heat a non-stick plan with a little Pam and place the meatballs so they are not too crowded together. Cook, turning every couple of minutes, until the meatballs are brown on all sides and cooked through. Add the cup of barbecue sauce and stir until the meatballs are completely covered. 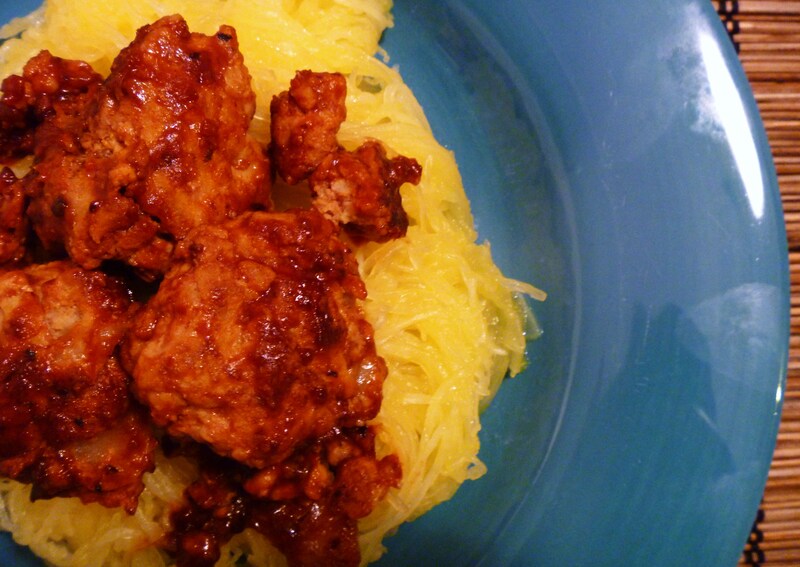 Remove the spaghetti squash from the microwave and, using a fork, pull out all of the “spaghetti” into a bowl. 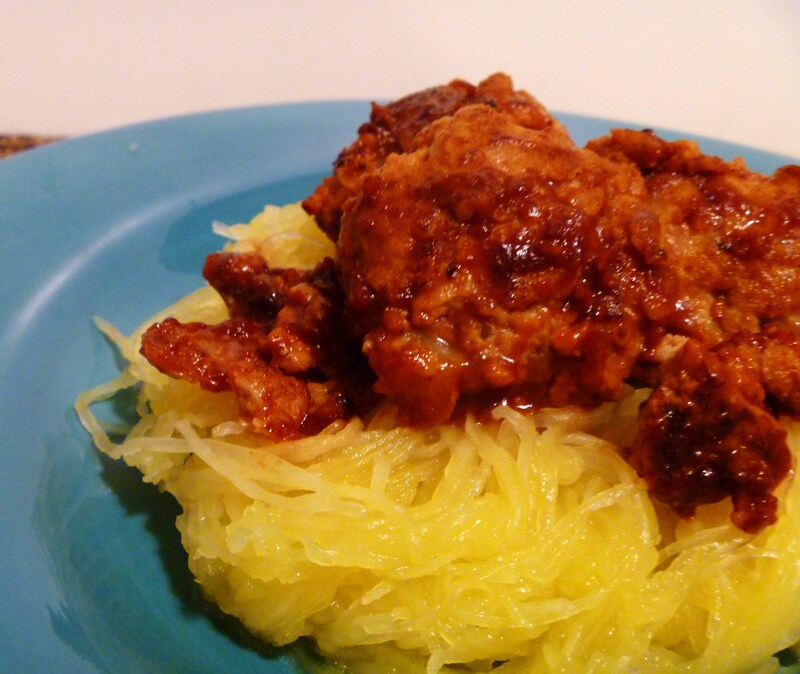 Serve the meatballs on top of the squash. 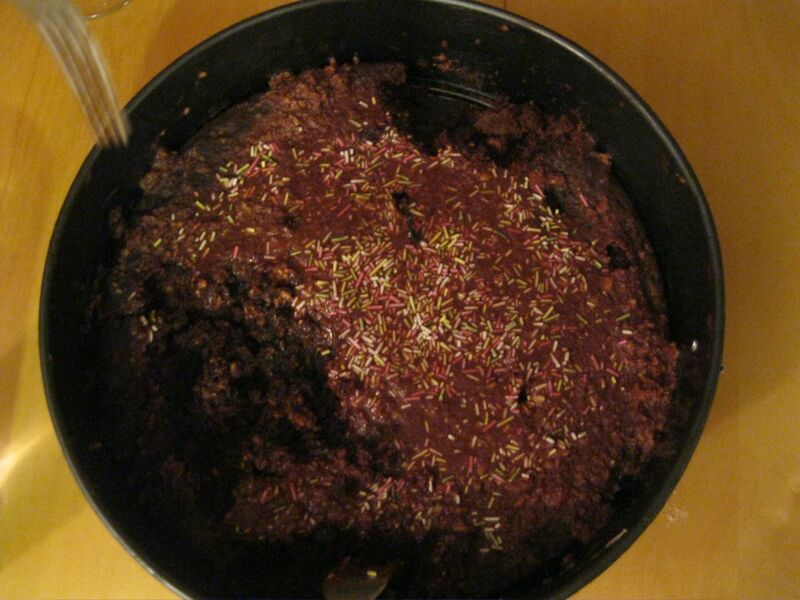 vegan, I was up for the challenge of tweaking childhood favorite recipes into dairy free delicacies. determined to bake her something that was just as fabulous as she is. have since tweaked it in the below recipe. 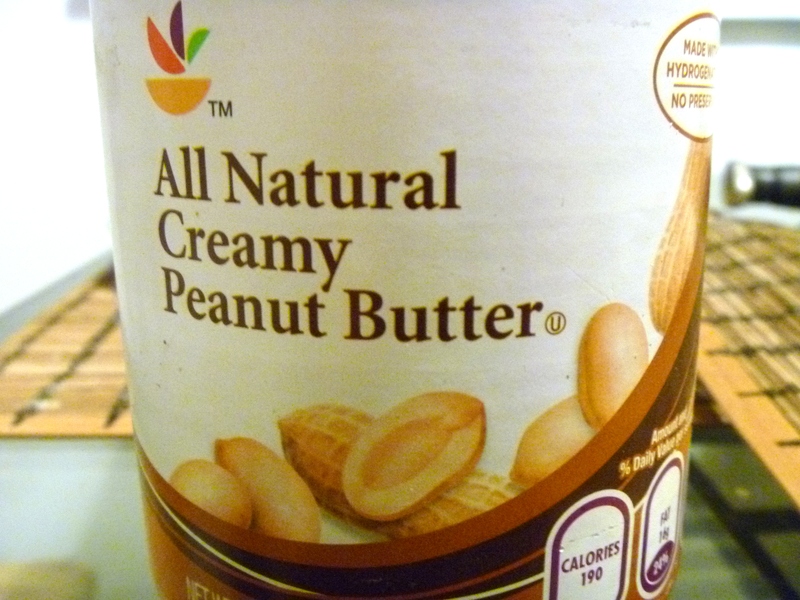 delicious topped with crushed peanut and/or drizzled with a peanut butter paste (peanut butter diluted with a bit of soy or almond milk) which you can put into a plastic bag and cut the corner off for piping. If you or your guests are allergic to nuts, the double chocolate cookie cake is still ultra decadent. There are also tweaks in the recipe to make it soy and/or gluten-free. were drooling too much to take the time to cut a slice. tofu (or egg replacer or flax seeds if you choose to use those instead) and vanilla and whisk until smooth and creamy. In a separate bowl, combine the flour, baking soda, cocoa powder and salt. Add to the margarine mixture and combine well. Add the peanut butter and mix well, then fold in the chocolate chips. Heat chocolate in a double boiler until melted (alternatively, microwave it at 30 second intervals). and beat until combined, then increase the speed to medium and beat for 1 minute more. If the frosting is dry, add more milk, 1 teaspoon at a time, until it is creamy but still holds peaks. I’m Ashley of Fashionably Fit, where I blog about my adventures as a bride-to-be who’s maintaining a 120-pound weight loss. I am really excited to share a post on Yumventures, because whether you are losing or maintaing weight, Sophie shares the kinds of recipes that exemplify healthy living. They’re not diet foods; they’re healthy, whole, delicious foods meant to be enjoyed in moderation. 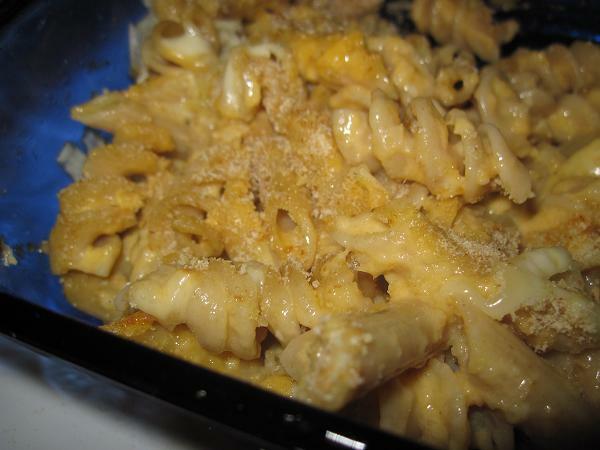 I’m going to share my experience making Fitness Magazine’s Healthy Mac ‘n’ Cheese recipe. 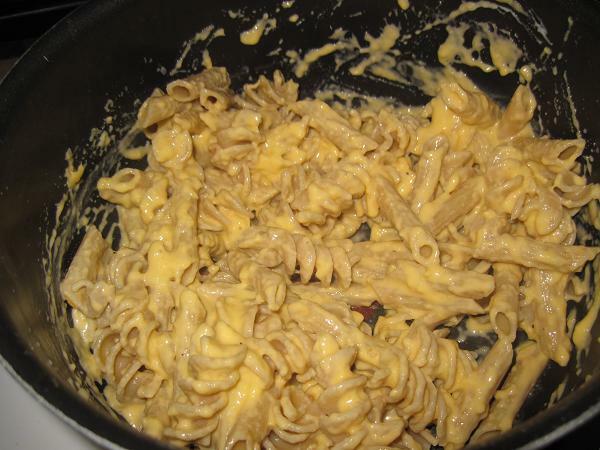 I always cringe a little when I see “lightened up” versions of comfort foods, because lightened or not, cheese-soaked pasta is not something I’d eat every day. Light or not, it’s still an indulgence! That said, I think these recipes are a great way to indulge in your favorite foods without feeling deprived. The key to this recipe is the onion-garlic puree, which adds a creamy element without adding any extra fat or calories. Normally, I shy away from recipes that require a lot of steps (and that dirty a lot of dishes) but this dish sounded too good to pass up out of laziness. 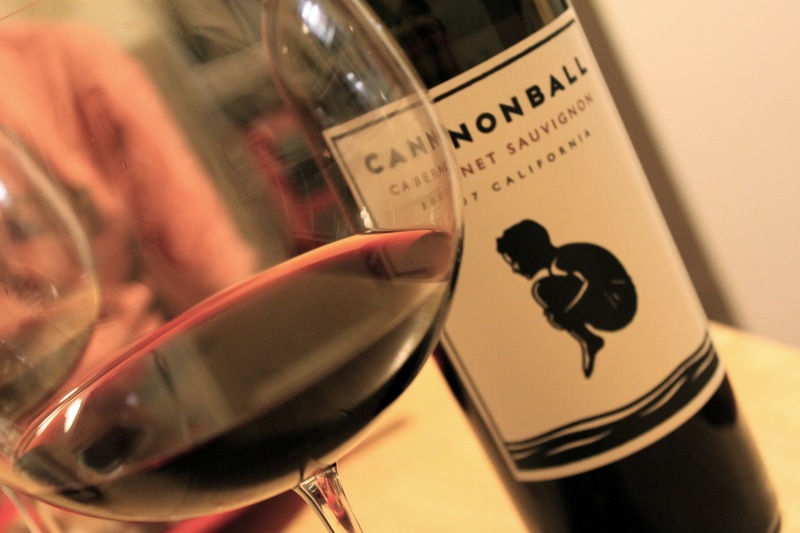 I wouldn’t try it on a weeknight, but it’s perfect for Saturday afternoon or Sunday night. 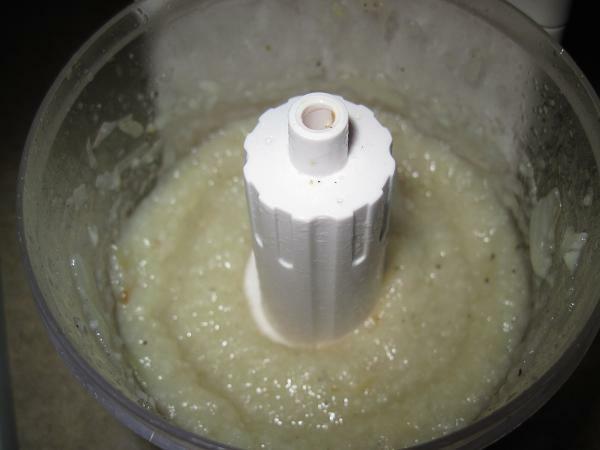 As instructed, the onion, garlic and 1/2 cup of water were put into the microwave for 10 minutes, then dumped into the mini-chopper, where it was transformed into a paste into no time at all. 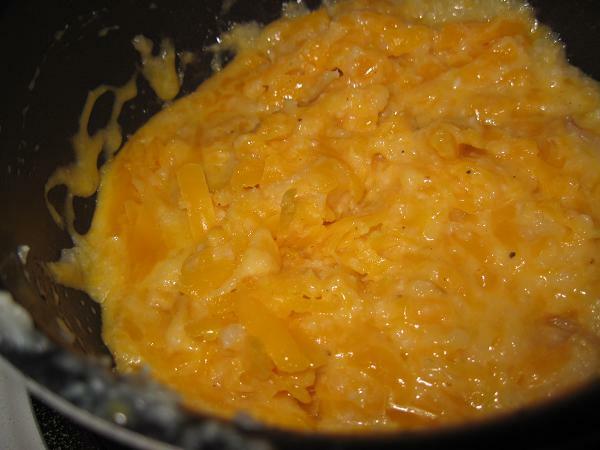 Then came the fun part: Bring the onion-garlic puree to a simmer in a small sauce pan and add the cheese, stirring as it melts. In the interest of full disclosure, I did not use low-fat or fat free cheese, simply because we already extra sharp cheddar on hand. Then you add the Greek yogurt. Then, you toss the pasta (I ended up using rigatoni and penne, because I had a little bit of each leftover from other dishes) with the cheese sauce. Top with the bread crumbs (my grocery did not carry panko) and bake as instructed, and this beauty will emerge from the oven. Even though I used the full-fat cheese and regular bread crumbs, this dish was still better than a macaroni and cheese that called for lots of heavy butter and cream. Between the Greek yogurt and onion-garlic puree, it was so creamy and full of flavor, you’d never guess it was a “lightened” dish. Hi, I’m Angela from A Healthy Fit and I’m so excited to be posting for Sophie while she is away. I love checking out what she is making in her kitchen and I wish I could make more interesting meals. When Sophie asked for guest posters I was excited because this meant I would be forced to make a real recipe. So, here we go! I use to have a weekly plan. On Sundays, I would sit down with my cookbooks and pick out a recipe that I had never made before. I adopted this plan because the same week night dinners were getting pretty boring and predictable. Somehow, this Sunday ritual went to the wayside and all that the Professor and I have been eating are our same 4-5 staple meals which include our favorite avocado enchiladas, Gardenburgers with sweet potato fries, tofu scrambles, and homemade pizza. Sure, these recipes are good and possibly timeless, but week after week, these meals only spell one thing…B-O-R-I-N-G! After watching my sister in-law slave away to cook us an amazing meal last weekend, I decided that I had to bring back my “one new meal a week” plan. 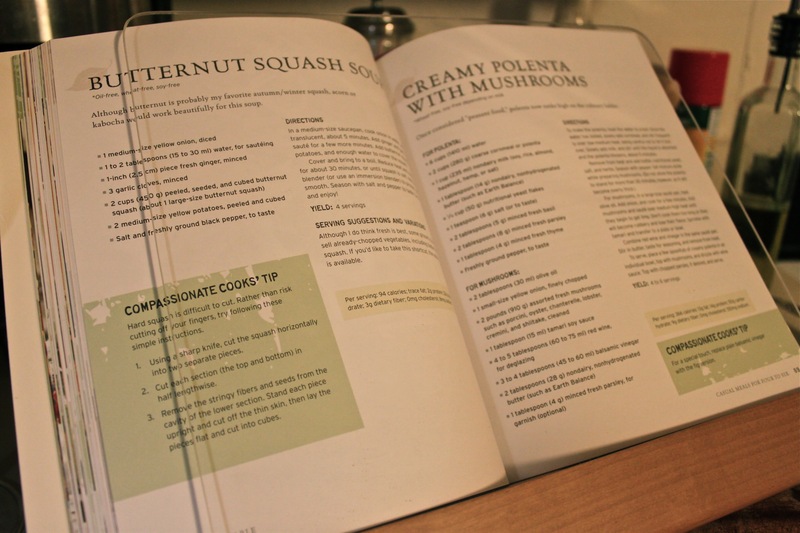 I decided to choose a recipe out of my newest (untouched) cookbooks, The Vegan Table by Colleen Patrick-Goudreau. I chose on her recipe for Creamy Polenta with Mushrooms. 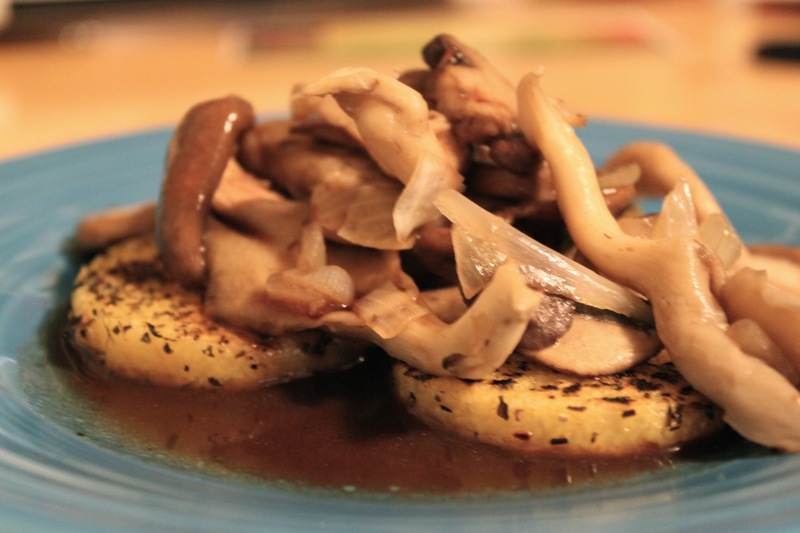 I had already bought some pre-made polenta, so I would really only be making the mushrooms. I was hoping that these mushrooms would resemble one of the best meals I had in my life at PortaBella on my honeymoon. A tall order considering those mushrooms were seriously the best thing I have ever tasted. I’m not joking. If you are in Carmel, you must go to PortaBella and get the Quattro Funghi alla Panna. To die for. I was also excited to make this recipe because it meant that I was able to use my new recipe book holder. This baby worked like a charm. In addition to propping your cookbook up, it also protects the pages from the spills and splatters associated with cooking. If you are like me and are a tornado in the kitchen, then you would understand the brilliance of some protective coverage. The other great thing about this recipe was that it called for red wine. Four tablespoons for the sauce, a glass for the professor and me! Alrighty, so enough of my ramblings. Let’s get to the recipe! Now, I ended up not making the polenta because I already had some in the fridge, but if you are interested in making it, you can view the recipe here. Now, on to the shroomies. Let’s get cookin’:For mushrooms, heat up the olive oil in a large sauté pan. Add onion and cook for a few minutes. Add mushrooms and sauté (medium heat) until they begin to get limp (the only time when getting limp is a good thing). You want to make sure that you don’t overcook them because if you do, they will lose their flavor and get a bit rubbery. No one likes rubbery shroomies! Sprinkle some tamari over those bad boys and transfer to a bowl. In the same pan that you used for the mushrooms, mix the red wine and vinegar. Stir in the “butter” and then take a little taste to make sure it is all good. Remove your sauce from the heat. 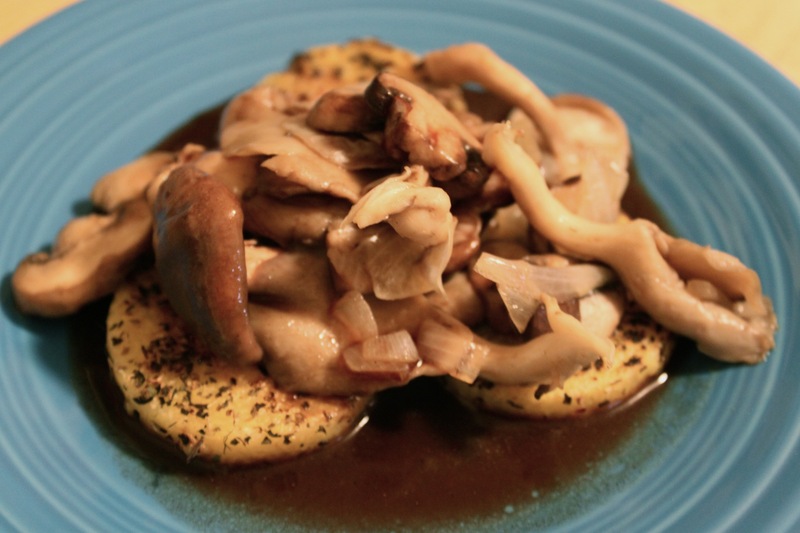 Place your polenta in a bowl (if you used the recipe) or on a plate if you heated up your pre-made polenta, load it up with mushrooms, and then drizzle the sauce. It was pretty darn good, but I think the sauce could be a bit more complex and possible a bit thicker, maybe some garlic could be added. I don’t know, but it was missing a lil’ somethin’ for me. It was not a replica of my honeymoon meal, but oh well. I’m glad that I am back on my “one new recipe a week” plan and this one was pretty darn good. I can’t wait to make some more recipes from this cookbook. 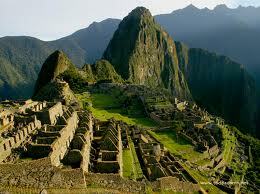 Tomorrow morning I’m leaving on a fabulous little vacation to…..Peru! While I am gone, I have some great guest posts lined up from some of your favorite Hollaback Girls. So stick around and see what delicious things they’ve been cooking up. See you after Columbus Day!